This tool works in conjunction with KML aware applications like Google Earth Pro Desktop and Marble. 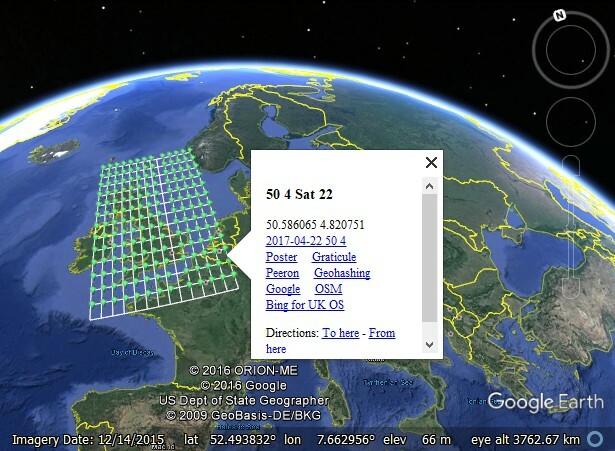 When you submit the form, if your PC is correctly set up, Google Earth Desktop will launch and show the calculated hashpoints. This seems to work on Android mobile phones and perhaps others too. UK geohashers might find the link to the Ordnance Survey maps particularly useful. Outside the UK you just get the normal Bing maps. For the Globalhash, zoom out until it comes into view. date Date: yyyy-mm-dd - if blank, the date defaults to today - alternatively use -7 to 7, 1 means tomorrow, -2 is the day before yesterday. lat Latitude: -89 to 89 - if blank, the latitude defaults to 51 (Grenwich). Whole numbers please. lon Longitude: -179 to 179 - if blank, the longitude defaults to 0 (Grenwich meridian). Whole numbers please. clat Centre Latitude: -89.9999 to 89.9999 - optional view centre. It's OK to leave this blank. clon Centre Longitude: -179.9999 to 179.9999 - - optional view centre. It's OK to leave this blank. skins Skins: 0 to 6. The default is 1. This gives 9 hashpoints. 6 skins will give you 169 hashpoints. debug Debug: Check this to get debuging information. The KML data will be shown as text. Disclaimer: Do no damage. Don't disturb people, animals or the environment. Stay safe!